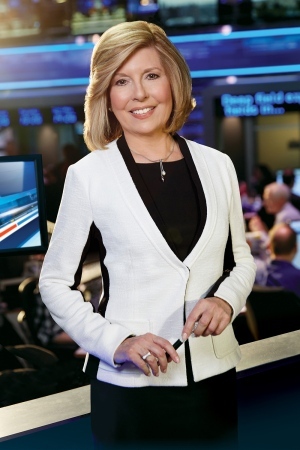 For more than 30 years, Sandie Rinaldo has been the weekend anchor for CTV NATIONAL NEWS, Canada’s most-watched national newscast. In addition to her role behind the desk, Rinaldo heads into the field to report stories for CTV’s investigative news program W5. Every weekend, Rinaldo takes Canadians through the major news events making headlines at home and around the world while focusing on angles that are most important to Canadians. Over the years, Rinaldo has received national recognition for her news stories, earning numerous prestigious nominations and awards. Most recently, Rinaldo was named to the 2013 Women’s Executive Network list of Canada’s Most Powerful Women in the Arts & Communications category. Additional awards include the Canadian Veterinary Award 2005 "Never Give Up"; Canadian Association of Journalism Award 2001 award for Best Overall Newscast (shared with Lloyd Roberson); RTNDA Award - Best Newscast 2001 "Egypt Air"; RTNDA Award - Best Newscast 2000 (shared with Lloyd Robertson) "Ice Storm" and RTNDA Award- Best Newscast 1999 "Swiss Air Crash”; and Gemini nominations for Best Newscast 2003/2002/2001 ("Bali Attack/ Sept 11 Aftermath/Egypt Air"); Gemini Nomination - Best Newscaster 2000; numerous Canadian Screen Award nominations for her investigations into abuse in nursing homes. In 1980, Rinaldo joined a slowly expanding circle of women in the profession, when she was promoted to News Anchor of CANADA AM, earning distinction for becoming the first woman in Canadian history to anchor a daily network newscast. In 1977, Rinaldo was appointed Reporter-at-Large for CANADA AM, a position that saw her regularly traveling everywhere from Vancouver to Cape Breton to the Middle East. Rinaldo joined CANADA AM in 1976 as a story producer specializing in federal and provincial politics. In May 2016, Rinaldo marked 43 years with CTV. It was May 6, 1973 when Rinaldo first walked through the door of the network, one week after graduating from York University where she earned an Honours B.A. in Fine Arts. In that first year, Rinaldo jumped from Junior Secretary to Production Secretary to Production Manager, and then became a researcher for W5. In 1975 Rinaldo went to New York City with the W5 team to produce The Bankruptcy of New York, which won a journalism award. Canadian Veterinary Award 2005 "Never Give Up"
RTNDA Award - Best Newscast 2001 "Egypt Air"
RTNDA Award - Best Newscast 2000 (shared with Lloyd Robertson) "Ice Storm"
RTNDA Award- Best Newscast 1999 "Swiss Air Crash"
Received the 1990 American Film & Video Award for work producing a medical video entitled, Childbirth From Inside-Out.